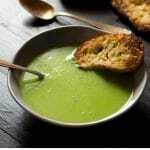 A healthy, light and comforting green pea soup made with frozen peas, leek and zucchini it's so simple and easy to make. This is great for chilly evenings or when you want something light. Finely chop the leek and sauté in a deep saucepan until soft, add the garlic and sauté for another minute. Add the zucchini/courgettes and stir for a few seconds before adding the stock. Bring to a boil and then simmer for 10 minutes. Add the peas a pinch of salt and pepper and simmer for another 5 minutes. Using a had blender blitz it all until smooth, serve in a bowl with a dollop of Greek yogurt and a little pepper. Please note this recipe was tested and developed using metric measurements all imperial are approximate.